2017-09-29 You can choose any card name, even if that card doesn't normally have an activated ability. You're not limited to the names of cards you saw in the opponent's hand. 2017-09-29 You can't choose the name of a token unless that token has the same name as a card. 2017-09-29 Activated abilities contain a colon. They're generally written "[Cost]: [Effect]." Some keyword abilities (such as equip and crew) are activated abilities and will have colons in their reminder text. Triggered abilities (starting with "when," "whenever," or "at") are unaffected by the last ability of Sorcerous Spyglass. 2017-09-29 An activated mana ability is one that produces mana as it resolves, not one that costs mana to activate. 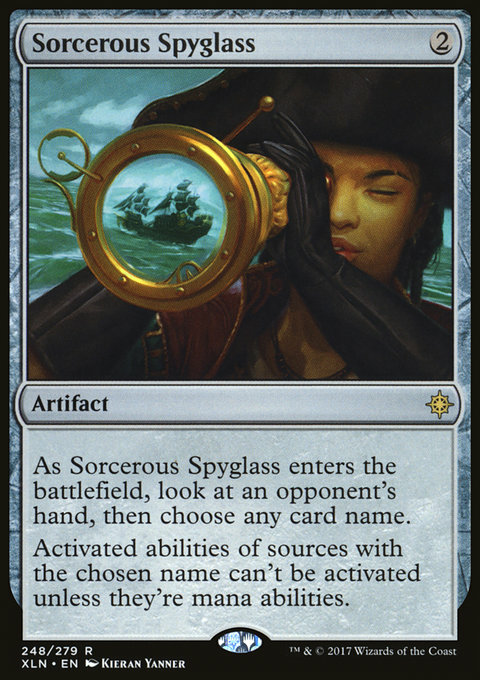 2017-09-29 Sorcerous Spyglass affects cards regardless of what zone they're in. This includes cards in hand, cards in the graveyard, and exiled cards.